UPDATED, July 13, 2010 — García was released under deal between Spain, the Catholic Church and the Castro dictatorship. The Cuban American National Foundation today published a report updating the medical condition and detailing the recent maltreatment of Dr. José Luis García Panque, 40, one the more than 20 Cuban journalists imprisoned in Fidel Castro's gulag. — García is in a prison hospital in Bayamo, suffering from chronic bloody diarrhea and persistent ulcerative colitis, symptoms of an intestinal disorder he has developed while in prison. (Numerous Cuabn political prisoners suffer from similar ailments.) His wife reports that he weighs about 110 pounds, and that his diarrhea has worsened because of the spoiled food he has received in prison. "My husband has not seen the sun for months and he is forced to endure extreme psychological pressure," said Yamilet Llanes Labrada. — A common prisoner threatened to kill García after several arguments. In one instance, the prisoner threw Garcia's clothes into a latrine full of excrement. Prison officials told García's wife they were not aware of the incidents. — The state-sanctioned abuse extends to García's four children. "Dr. Garcia Paneque's four children are psychologically affected by their father's imprisonment and by the constant harassment they must sustain," the CANF report states. "Three times a week, groups of elderly Cubans cry out governmental slogans just two houses away from Garcia Paneque's home. Sheila, the eldest child,15 years old, is barred from studying computer technology in spite of her high school grades, and she is being pressured to sign up with the Union of Communist Youth, an organization she refuses to join." Llanes has requested that her husband be released on a medical parole, similar to how a handful of other political prisoners have been released, but so far, there has been no response from the government. García, a former surgeon, was arrested March 18, 2003, during the "black spring" roundup of 75 journalists, human rights activists and other dissidents. After he was convicted at trial on April 4, he was sentenced to 24 years in prison, even though prosecutors had asked for an 18-year sentence. García had been active in the opposition since at least 1997, when he was fired from his position at the Ernesto "Ché" Guevara Hospital in Las Tunas because of his activities. The next year, he started the Libertad news agency. He also was a member of the Manuel Marquez Sterling Journalists’ Association and ran the Carlos J. Finlay independent library in Las Tunas, according to Reporters Without Borders. For more on García, in English, visit Cuba Political Prisoner.info, and in Spanish, visit Payolibre. 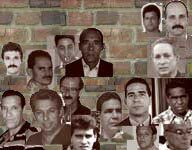 For more about the imprisoned independent journalists in Cuba, go to Payolibre, CubaNet, Cuban Political Prisoners.infor or Reporters Without Borders.